Welcome to your source for all of the most up to date information on Chipotle Mexican Grill® complete with a full menu with prices. Chipotle serves your favorite Mexican street foods prepared with the freshest ingredients in a fast yet casual dining atmosphere. 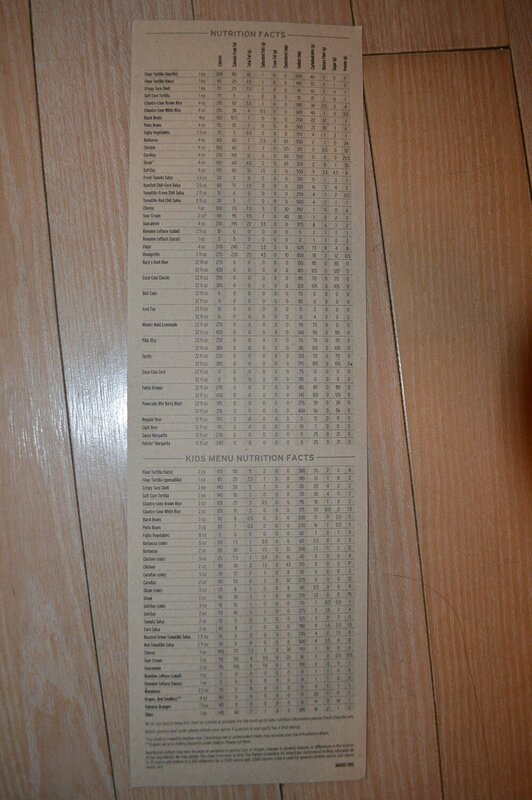 At Chipotle you get to make all the decisions about what you want on your plate. Vegetarians and meat lovers alike will appreciate the endless combinations of tasty food with bold flavors. 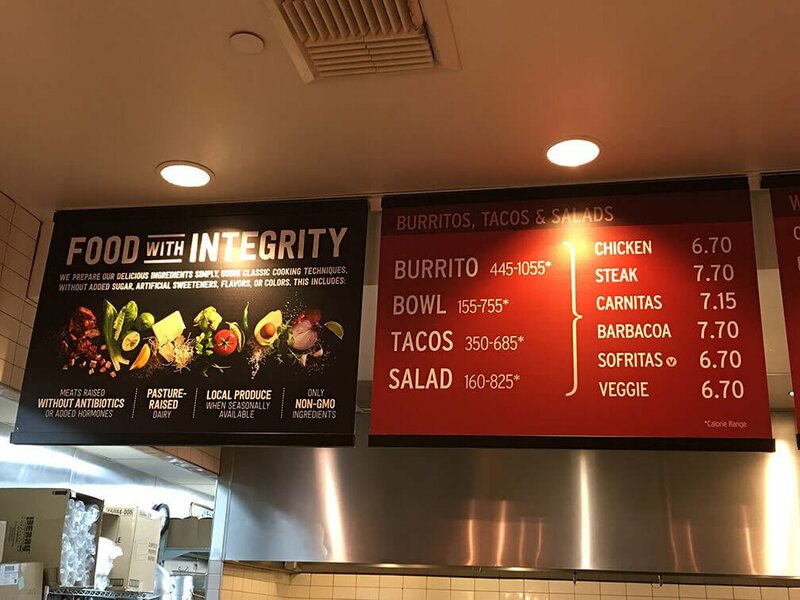 Well known for their commitment to using ethically raised meat, locally sourced produce, and on site preparation, Chipotle is a favorite destination for a fast bite that doesn’t compromise on quality or ethics. Burrito Flour tortilla with a choice of cillantro-lime rice, black or pinto beans, meat, salsa, and cheese or sour cream. Burrito Bowl Just like burrito, but served in a bowl with no tortilla. Tacos Your choice of three crispy corn, soft corn, or soft flour tortillas with meat, salsa, cheese or sour cream and romaine lettuce. Salad Chopped romaine lettuce with choice of beans, meat, salsa and cheese, with or without chipotle-honey vinaigrette. 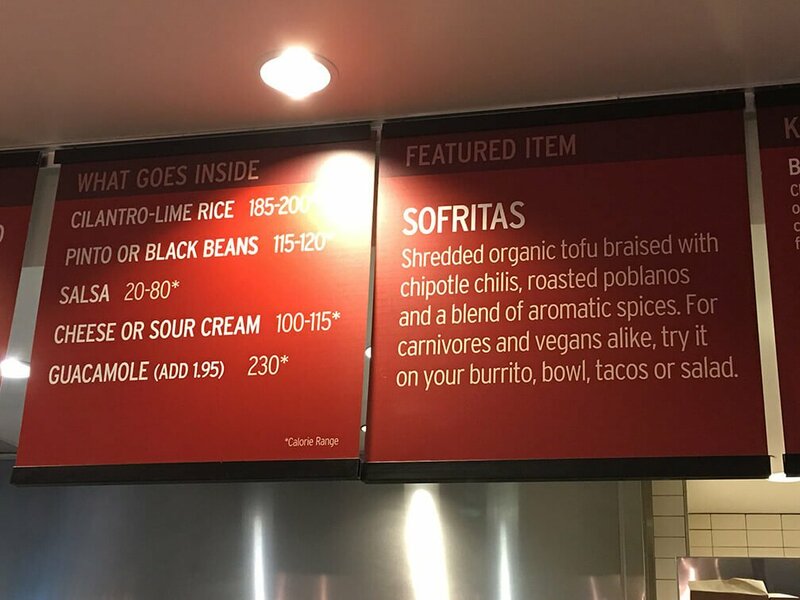 The menu at Chipotle merges simplicity and customer choice. It is based on four main styles of food built to order allowing you to pick the ingredients that you love best. The focus is on high quality ingredients prepared on-site, so you know no matter what you choose it will be tasty and fresh. The first thing to decide is if you want to order from the Salad, Burrito, Taco, or the Bowl menu. Tacos come in a variety of shells: soft flour or corn or crispy corn. Salads are piled high with romaine lettuce and served with a house made chipotle-honey vinaigrette. There is also a kid friendly menu with budget prices and kid friendly choices. No matter what you choose you can top it off with one of five meats including steak, carnitas, chicken, tender marinated beef barbacoa, or braised tofu sofritas for the vegetarian. Then choose from four specialty salsas and all your favorite south-of-the-border toppings. Start off with some crunchy fresh fried tortilla chips paired with handmade guacamole for $3.30. Start with chicken that has been vegetarian fed and raised without antibiotics and marinate overnight in a smoky adobo sauce then grill to perfection. Then, serve it over rice with black or pinto beans and all your favorite toppings. Don’t forget the fresh made guacamole! $6.70. Just right for the fussy eater, this Kids Menu classic comes with fruit or chips and a drink. Plain or chocolate organic milk or organic juice compliments this healthy meal. $3.75. After graduating from the Culinary Institute of America, Chipotle founder Steve Elis opened the first Chipotle restaurant in Denver, Colorado in 1993. The venture was originally a way for Elis to fund the capital for a fine dining restaurant that he dreamed of one day owning. Instead, the restaurant was so successful that he focused on growth and opened two new locations by the end of the first year. By 1998, Chipotle had restaurants in Colorado, Minnesota and Missouri. McDonald’s invested in the company, and they quickly expanded to over 500 locations by 2005. They went public in 2006 and McDonalds divested and reaped a large return of $1.5 billion from their $360 million investment. The company has over 1,700 locations as of 2015. 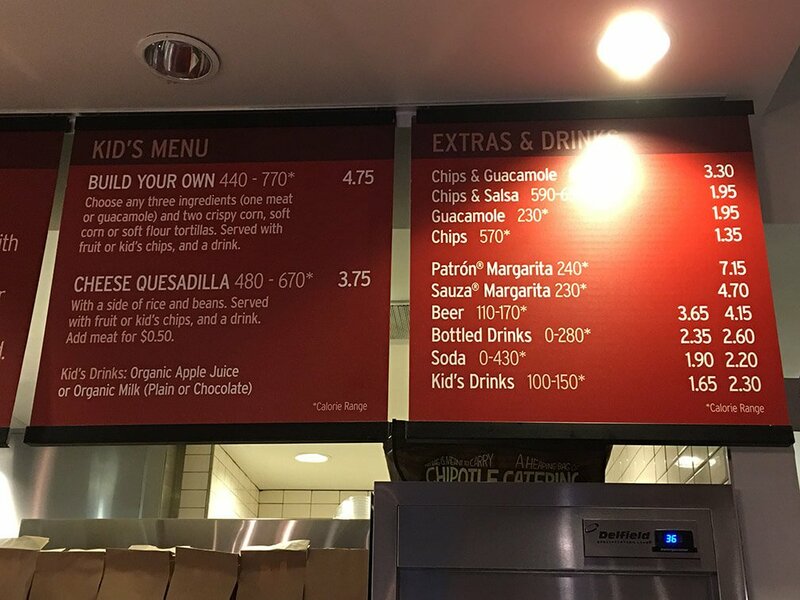 Chipotle menu prices are subject to change without prior notice. Prices shown in images & the following table should be seen as estimates, and you should always check with your restaurant before ordering. 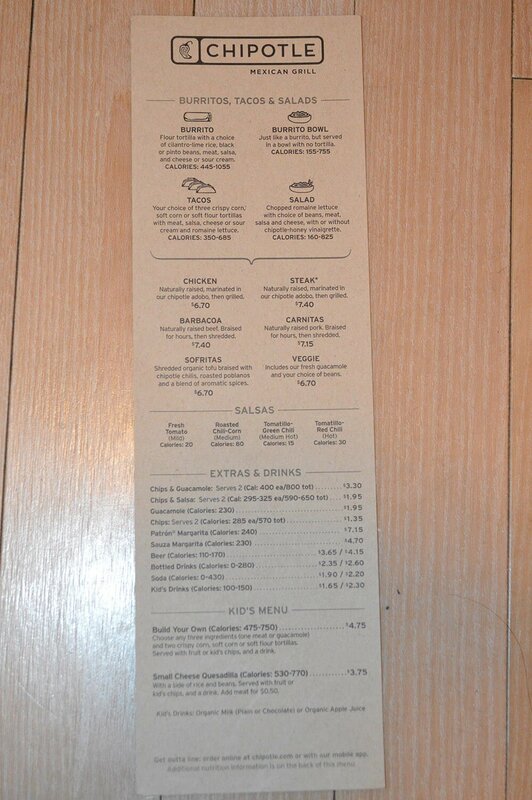 Chipotle menu images sourced via e-mail from restaurant customer & menu-price.net user. menu-price.net does not guarantee the pricing or availability of any menu items listed in image or table format on this page. Pricing may vary from location to location.